Park Slope Gallery relishes its status as an independent art gallery. We can take risks and follow our passions, without regard to the corporate pressures that govern so much of the art world today. In business since 1984, we have curated many compelling exhibitions and have held warm and lively openings to thank our clients for their continued support of this quite unusual concept we have evolved. Among the most memorable exhibitions was Leon Bibel’s artwork from his WPA era period (1994) and another of his 1960’s abstract works (2008 and current). 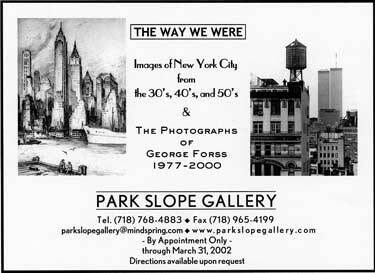 We showed George Forss’ stunningly powerful New York City black and white silver gelatin photographs in an exhibition called The Way We Were (2002), as well as Gotham Revealed (1996), an exhibition of unique views of New York City where access to unusual vantage points was a revelation. Our exhibition of Hazel Jarvis’ calming and beautiful watercolors in a range of botanical and still life subjects was a great favorite. We have had several folk art exhibitions featuring Roger Dumont’s wonderful cast of wood sculpture characters along with folk art paintings (2001, 2003, 2004). We also put together a group show dedicated to the art and design of the 1940s and 1950s (2000). 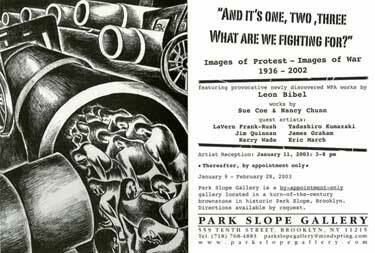 In 1990, the exhibition Between the Parks was dedicated to the art of New York City between Prospect Park and Central Park. In 2004, we exhibited Artist as Subject/The Studio as Inspiration and A Break from Reality: Abstraction: 1930s-1960s. We hosted two comprehensive exhibitions of the work of a very talented young artist, Eric March (2006 and 2009). These shows explored Prospect Park to Coney Island to Long Island City, and places in between. They revealed Eric’s virtuosity in capturing both the natural and structural aspects of our city in a range of media. A 2006 exhibition, Performing Arts, was dedicated to the art of performance…dance, music, original set designs by Allen Moyer, and stunning calligraphy of several opera librettos by Julio Vega. 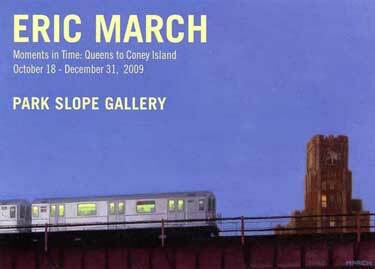 We have also hosted events ranging from a screening of slow animation by Jim Torok at our Quirky Mix exhibition in 1994 to art class visits to a Save Coney Island lecture in 2009. We have also had book signings to accompany several of our exhibitions. 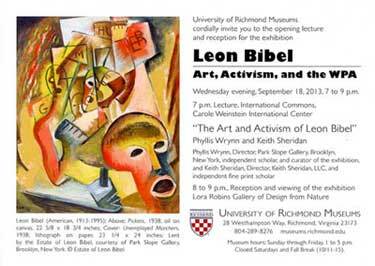 Phyllis Wrynn has curated two national exhibitions of Leon Bibel’s WPA art, one in Philadelphia in 2011…and one at the University of Richmond in Virginia in 2013. Our gallery extends beyond our walls. In addition to these exhibitions, it is also accompanied by art throughout our live/work environment hung salon-style, everywhere! Click here to view one of our past newsletters.